Her cause, it turns out, is the use of animals in cosmetic testing, and the pictures were taken about a year ago at a Regent Street shop window as part of an awareness campaign by the Humane Society International. 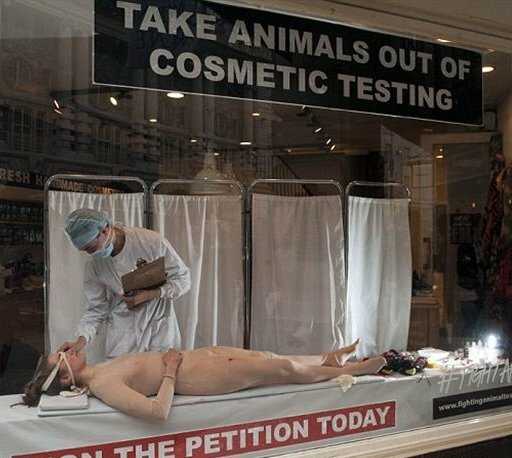 …was restrained, force-fed and injected with cosmetics in a high street shop window as part of a hard-hitting protest against animal testing. The 24-year-old endured 10 hours of experiments, which included having her hair shaved and irritants squirted in her eyes. Jacqueline appeared genuinely terrified as she was pinned down on a bench and had her mouth stretched open with two metal hooks while a man in a white coat force-fed her until she choked and gagged. The artist was also injected with numerous needles, had her skin braised and lotions and creams smeared across her face. 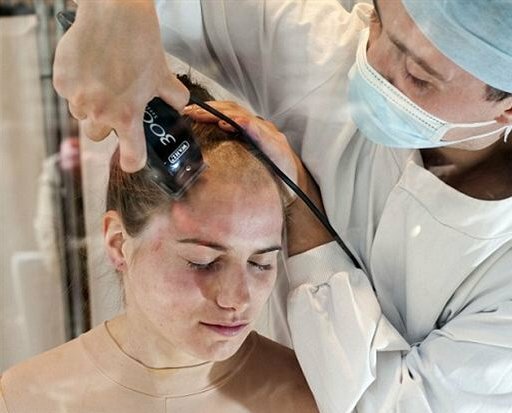 Passers-by were gobsmacked to see Jacqueline, a social sculpture student at Oxford Brookes University, forced to have a section of her head shaved. The gruesome spectacle aimed to highlight the cruelty inflicted on animals during cosmetic laboratory tests and raise awareness that animal testing is still a common practise.